Aloha nui everyone. It is with great honor and pride that KUA welcomes Aunty Pam Fuji’i to our board this new year. We look forward to much impact, growth and inspiration with her leadership in the new year. 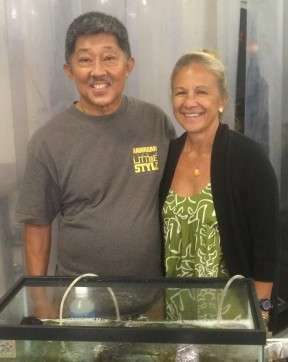 I met Pam and Dennis Fujii about three years ago when Uncle Henry Chang Wo invited them to help us with our limu growing operation at Anuenue Fisheries Research Center. Up until that introduction Ewa Limu Project was a two man organization. From that day on we became a four person organization with Pam and Dennis providing invaluable support in all events that Uncle Henry and I were involved with. 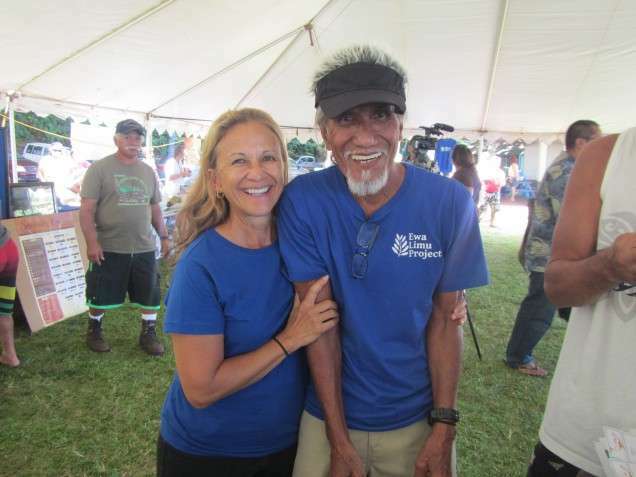 Through this process and Henry’s support of the Hāʻena Community Based Subsistence Fishing Area effort we also learned that Pam was a member of the Lota ʻohana, one of the original Hāʻena families. Dennis, Pam and Henry flew up to Kauaʻi on their own to support the effort. 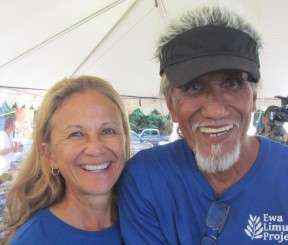 Through their support in Hāʻena and the ʻEwa Limu Project they also became intimately involved in supporting KUA’s Limu Hui, E Alu Pū and Hui Mālama Loko Iʻa networks purely as volunteers with a passion for community based mālama ʻāina efforts. Pam and Dennis are a force of nature and aloha. Pam is such a nurturing and caring person that Uncle and I would tease her by calling her mom. She treats everybody as if she were their mom. Pam always has a positive attitude and is always fun to be with. Never a dull moment with Aunty Pam. She can be goofy at times but she can also be serious when the situation calls for it. When Uncle Henry was passing away late this year Pam was at his bedside holding his hand. As Uncle removed his oxygen tubes and closed his eyes the room became filled with a deep and sad whaling as family members pleaded with him to awaken. Aunty Pam, with much aplomb took control of the situation. She calmly urged that a call be made to Hospice and other assistance. It was not until the room had calmed and Henry taken care of that she allowed her own tears to flow. It is because of her passion, compassion, energy and strong work ethic that Pam was nominated to serve as a member of KUA Board of Directors. Lucky for KUA, she accepted that nomination and the Board unanimously accepted her. There is no doubt that she will put her heart and soul into fulfilling her duties as a board member. We welcome her with open arms into our KUA ʻohana. Congratulations, Aunty Pam! I am so happy for you, and I know you will continue to touch people’s lives for the better, as you did with mine. You are amazing, and KUA is lucky to have you! What a wonderful tribute to a truly remarkable woman who many know as Aunty Pam: mentor, co-worker, and friend. All the best to you Aunty Pam on your role as board member for all the good that will come from your efforts there! You enlarge our hearts for the work of restoration! Congratulations and Mahalo! Congratulations Aunty Pam Fujii! You are an inspiration to your Ohana. Thank you for being a part of this amazing organization in perpetuating community-based natural resources management in Hawaiʻi. Uncle Henry would be so proud of you. Mahalo nui for all that you do and continue to do in preserving Hawaii’s natural and cultural resources for future generations. Congratulations, Aunty Pam! I am so happy for you, and I know that you will continue to change lives for the better, as you did with mine. You are amazing, and KUA is lucky to have you! Congratulation Aunty Pam! KUA is lucky to have you and I know that you will continue to inspire and educate in this new position. Congratulations to my wonderful and caring niece, Pamela. I am so proud of you and know how hard you have worked to achieve this special honor. We can’t forget Dennis and all of his special support for you and this organization. Good luck, and love you. Aunty Nobey and Uncle Bill. Mai ka’i Pamela. Bob and I are also grateful that we know you and Dennis and Aunty Eileen and your ‘ohana. Pam, That is such a wonderful article written by Uncle Wally. It’s true…Kua is lucky to have you (and Dennis)! Congratulations Pam! Ditto what Diane said. You are such a loving, caring, passionate person that itʻs no surprise that they unanimously approved your appointment to the board. Congratulations Pam! Ditto what Diane said. You are such a loving, caring, passionate person that itʻs no surprise that they unanimously approved your appointment to the board. Much love, Norine. P.S. I cried when I read the part about Uncle Henry.